Years of experience developing hybrid mountain bike frames have gone into the Womens Cross Hybrid One 400 2019. 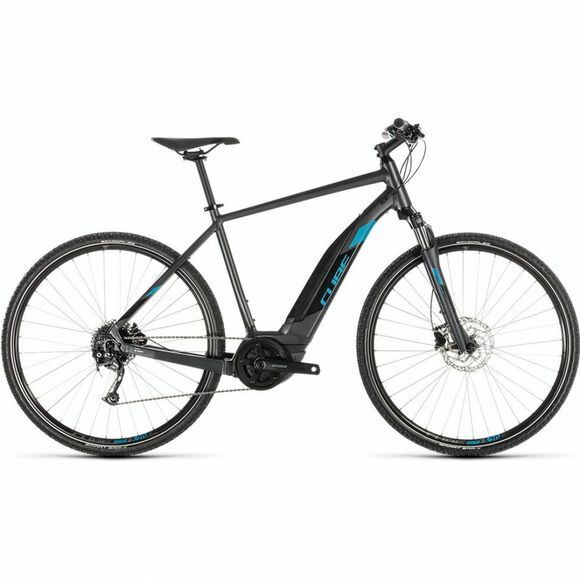 You may never intend to ride further off-road than a forest track or canal towpath, but isn't it reassuring to know that your Bosch e-bike has real go-anywhere pedigree? We thought so too. That's the reason you'll find features like double butted aluminium superlite tubes and a tapered head tube, for extra strength without extra weight. Schwalbe's Smart Sam tyres have the grip to cope with pretty much any surface, while the Suntour suspension fork smooths out the rough edges and the powerful Shimano MT200 hydraulic disc brakes serve up plenty of all-weather stopping power. The reliable and powerful Bosch drive unit and integrated battery are stars of the show, of course, feeding both your and the motor's power to the rear wheel via Shimano's slick gears. And, with a trapeze frame option and a wide range of sizes, Cube have got every rider covered. Hop on, take off and explore. So neatly integrated is Bosch's motor and battery, many people won't even realise you're riding an e-bike. The clean looks are the result of our engineering team's long experience of working with – and designing arround – the superb Bosch system. The fully integrated battery and motor are protected from the elements, and you don't even need to remove the battery from the frame in order to charge it. Cube have kept the Cross Hybrid ONE's centre of gravity deliberately low to provide easy, reassuring handling, while a full set of mudguard and rack mounts means you can easily add the accessories you need for daily use.